Some 300 protesters locked arms and blocked the thoroughfare, demonstrating against the city’s failure to so far implement a land agreement ordered by Prime Minister Hun Sen earlier this year. Four leaders of a Monday demonstration by Boeung Kak lake protesters were released pending trial Tuesday, after Phnom Penh Municipal Court charged them with insult and obstruction of public officials. The four women—Tep Vanny, 31, Bu Chorvy, 37, Heng Mom, 42, and Kong Chantha, 44—were arrested during a protest Monday that blocked traffic on Monivong Boulevard in front of City Hall. 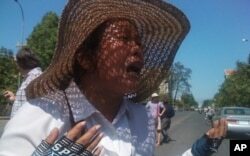 An identified woman, Boeung Kak lake protester, crying at the demonstration Monday. Protesters clashed with police and threw water bottles. Some tore off their clothes and lie in the road. At least two women threatened suicide over the loss of their homes. Tep Vanny, an outspoken advocate for villagers who say they want land on a contentious development site at Boeung Kak lake, said they would not stop until they were granted the 12.44 hectares of land promised by the authorities. Some residents have said they were arbitrarily excluded from the deal with the city, which was meant to allay the anger of villagers unwilling to take a development company buyout or relocation. 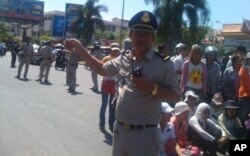 A group of Cambodian police officers maintaining traffic and demonstrators at Monivong Boulevard in front of City Hall. Chhin Lida, a defense lawyer for the four women, said he welcomed their release under court supervision but said he would fight against further arrest or detention. Am Sam Ath, lead investigator for the rights group Licadho, said authorities were now putting more pressure on the lake residents to prevent further protests.